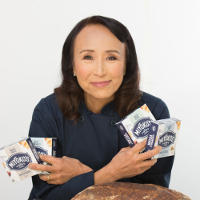 Founder and CEO of Miyoko’s Kitchen, Miyoko Schinner sparked the rise of the multi-million dollar plant-based cheese revolution by pioneering a proprietary technology for making dairy products from plants. Miyoko has redefined the categories of “cheese” and “butter” with complex flavors that have garnered multiple awards and the attention of major media such as The New York Times, Forbes, Food and Wine, Good Morning America, and many more. Miyoko’s products are sold nationwide in thousands of retailers including Whole Foods, Sprouts, Trader Joe’s, Kroger, Publix, Wegman’s, Target, and many more. The bestselling author, chef, speaker, and entrepreneur has dedicated 30+ years to changing the culture of food through her five books, television shows, and talks. She is a founding board member of the Plant Based Foods Association, a trade organization helping to level the playing field for plant-based foods. Her dedication to animals led to the co-founding of Rancho Compasión a farmed animal sanctuary in Nicasio, California, that provides a home to over 70 farm animals, where she starts each day caring for cows, goats, pigs, sheep, turkeys, chickens, and ducks, which she considers her daily mediation.